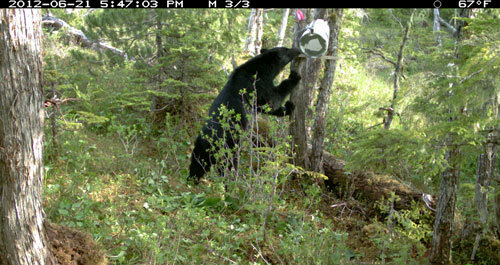 A black bear explores a snare on Prince of Wales (POW) Island. This bear manages to trip the snare without getting caught. A trail camera catches the details. Biologists are catching bears on POW and equipping them with GPS collars. Since the summer of 2010, 55 bears on POW have been equipped with GPS or VHF radio collars to learn more about their life history.